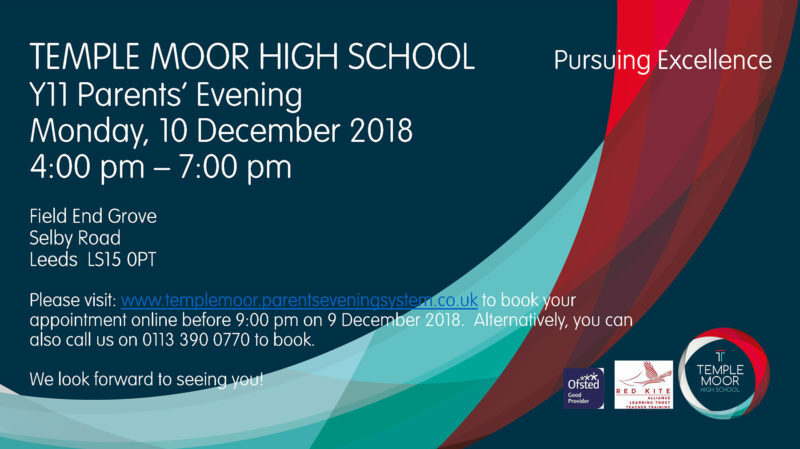 We would like to invite our Y11 parents to the Parents’ Evening on Monday, 10 December 2018. The school uses an intuitive and easy to use online booking system allowing parents to make their own five minute appointment between 4:00pm and 7:00pm. It is advisable to log in as early as possible to secure your preferred time. Appointments are open from Wednesday, 21 November 2018 and will close on Sunday, 9 December at 9:00pm. If you do not have access to the internet, please contact the school on 0113 390 0770 and we will be happy to make an appointment on your behalf.